The liver, an organ only found in vertebrates, detoxifies various metabolites, synthesizes proteins, and produces biochemicals necessary for digestion. In humans, it is located in the right upper quadrant of the abdomen, below the diaphragm. Its other roles in metabolism include the regulation of glycogen storage, decomposition of red blood cells and the production of hormones. The liver is an accessory digestive gland that produces bile, an alkaline compound which helps the breakdown of fat. Bile aids in digestion via the emulsification of lipids. The gallbladder, a small pouch that sits just under the liver, stores bile produced by the liver which is afterwards moved to the small intestine to complete digestion. The liver's highly specialized tissue consisting of mostly hepatocytes regulates a wide variety of high-volume biochemical reactions, including the synthesis and breakdown of small and complex molecules, many of which are necessary for normal vital functions. Estimates regarding the organ's total number of functions vary, but textbooks generally cite it being around 500. Terminology related to the liver often starts in hepat- from ἡπατο-, from the Greek word for liver. No way is yet known to compensate for the absence of liver function in the long term, although liver dialysis techniques can be used in the short term. Artificial livers are yet to be developed to promote long-term replacement in the absence of the liver. As of 2018, liver transplantation is the only option for complete liver failure. The liver is a reddish-brown, wedge-shaped organ with four lobes of unequal size and shape. A human liver normally weighs approximately 1.5 kg (3.3 lb), and has a width of about 15 cm (6 in). It is both the heaviest internal organ and the largest gland in the human body. Located in the right upper quadrant of the abdominal cavity, it rests just below the diaphragm, to the right of the stomach and overlies the gallbladder. The liver is connected to two large blood vessels: the hepatic artery and the portal vein and common hepatic duct. The hepatic artery carries oxygen-rich blood from the aorta via the celiac plexus, whereas the portal vein carries blood rich in digested nutrients from the entire gastrointestinal tract and also from the spleen and pancreas. These blood vessels subdivide into small capillaries known as liver sinusoids, which then lead to lobules. Lobules are the functional units of the liver. Each lobule is made up of millions of hepatic cells (hepatocytes), which are the basic metabolic cells. The lobules are held together by a fine, dense, irregular, fibroelastic connective tissue layer which extends from the fibrous capsule covering the entire liver known as Glisson's capsule. This extends into the structure of the liver, by accompanying the blood vessels (veins and arteries), ducts, and nerves at the hepatic hilum. The whole surface of the liver except for the bare area, is covered in a serous coat derived from the peritoneum, and this firmly adheres to the inner Glisson's capsule. The liver is grossly divided into two parts when viewed from above – a right and a left lobe, and four parts when viewed from below (left, right, caudate, and quadrate lobes). The falciform ligament divides the liver into a left and right lobe. From below, the two additional lobes are located between the right and left lobes, one in front of the other. A line can be imagined running from the left of the vena cava and all the way forward to divide the liver and gallbladder into two halves. This line is called "Cantlie's line". Other anatomical landmarks include the ligamentum venosum and the round ligament of the liver (ligamentum teres), which further divide the left side of the liver in two sections. An important anatomical landmark, the porta hepatis, divides this left portion into four segments, which can be numbered starting at the caudate lobe as I in an anticlockwise manner. From this parietal view, seven segments can be seen, because the eighth segment is only visible in the visceral view. On the diaphragmatic surface, apart from a triangular bare area where it connects to the diaphragm, the liver is covered by a thin, double-layered membrane, the peritoneum, that helps to reduce friction against other organs. This surface covers the convex shape of the two lobes where it accommodates the shape of the diaphragm. The peritoneum folds back on itself to form the falciform ligament and the right and left triangular ligaments. These peritoneal ligaments are not related to the anatomic ligaments in joints, and the right and left triangular ligaments have no known functional importance, though they serve as surface landmarks. The falciform ligament functions to attach the liver to the posterior portion of the anterior body wall. The visceral surface or inferior surface, is uneven and concave. It is covered in peritoneum apart from where it attaches the gallbladder and the porta hepatis. Several impressions on the surface of the liver accommodate the various adjacent structures and organs. Underneath the right lobe and to the right of the gallbladder fossa are two impressions, one behind the other and separated by a ridge. The one in front is a shallow colic impression, formed by the hepatic flexure and the one behind is a deeper renal impression accommodating part of the right kidney and part of the suprarenal gland. The suprarenal impression is a small, triangular, depressed area on the liver. It is located close to the right of the fossa, between the bare area and the caudate lobe, and immediately above the renal impression. The greater part of the suprarenal impression is devoid of peritoneum and it lodges the right suprarenal gland. Medial to the renal impression is a third and slightly marked impression, lying between it and the neck of the gall bladder. This is caused by the descending portion of the duodenum, and is known as the duodenal impression. The inferior surface of the left lobe of the liver presents behind and to the left the gastric impression. This is moulded over the upper front surface of the stomach, and to the right of this is a rounded eminence, the tuber omentale, which fits into the concavity of the lesser curvature of the stomach and lies in front of the anterior layer of the lesser omentum. Microscopically, each liver lobe is seen to be made up of hepatic lobules. The lobules are roughly hexagonal, and consist of plates of hepatocytes radiating from a central vein.The central vein joins to the hepatic vein to carry blood out from the liver. A distinctive component of a lobule is the portal triad, which can be found running along each of the lobule's corners. The portal triad, misleadingly named, consists of five structures: a branch of the hepatic artery, a branch of the hepatic portal vein, and a bile duct, as well as lymphatic vessels and a branch of the vagus nerve. Between the hepatocyte plates are liver sinusoids, which are enlarged capillaries through which blood from the hepatic portal vein and hepatic artery enters via the portal triads, then drains to the central vein. Histology, the study of microscopic anatomy, shows two major types of liver cell: parenchymal cells and nonparenchymal cells. About 70–85% of the liver volume is occupied by parenchymal hepatocytes. Nonparenchymal cells constitute 40% of the total number of liver cells but only 6.5% of its volume. The liver sinusoids are lined with two types of cell, sinusoidal endothelial cells, and phagocytic Kupffer cells. Hepatic stellate cells are nonparenchymal cells found in the perisinusoidal space, between a sinusoid and a hepatocyte. Additionally, intrahepatic lymphocytes are often present in the sinusoidal lumen. The central area or hepatic hilum, includes the opening known as the porta hepatis which carries the common bile duct and common hepatic artery, and the opening for the portal vein. The duct, vein, and artery divide into left and right branches, and the areas of the liver supplied by these branches constitute the functional left and right lobes. The functional lobes are separated by the imaginary plane, Cantlie's line, joining the gallbladder fossa to the inferior vena cava. The plane separates the liver into the true right and left lobes. The middle hepatic vein also demarcates the true right and left lobes. The right lobe is further divided into an anterior and posterior segment by the right hepatic vein. The left lobe is divided into the medial and lateral segments by the left hepatic vein. The hilum of the liver is described in terms of three plates that contain the bile ducts and blood vessels. The contents of the whole plate system are surrounded by a sheath. The three plates are the hilar plate, the cystic plate and the umbilical plate and the plate system is the site of the many anatomical variations to be found in the liver. About 20,000 protein coding genes are expressed in human cells and 60% of these genes are expressed in a normal, adult liver. Over 400 genes are more specifically expressed in the liver, with some 150 genes highly specific for liver tissue. A large fraction of the corresponding liver specific proteins are mainly expressed in hepatocytes and secreted into the blood and constitute plasma proteins. Other liver specific proteins are certain liver enzymes such as HAO1 and RDH16, proteins involved in bile synthesis such as BAAT and SLC27A5, and transporter proteins involved in the metabolism of drugs, such as ABCB11 and SLC2A2. Examples of highly liver-specific proteins include apolipoprotein A II, coagulation factors F2 and F9, complement factor related proteins, and the fibrinogen beta chain protein. Organogenesis, the development of the organs takes place from the third to the eighth week during embryogenesis. The origins of the liver lie in both the ventral portion of the foregut endoderm (endoderm being one of the three embryonic germ layers) and the constituents of the adjacent septum transversum mesenchyme. In the human embryo, the hepatic diverticulum is the tube of endoderm that extends out from the foregut into the surrounding mesenchyme. The mesenchyme of septum transversum induces this endoderm to proliferate, to branch, and to form the glandular epithelium of the liver. A portion of the hepatic diverticulum (that region closest to the digestive tube) continues to function as the drainage duct of the liver, and a branch from this duct produces the gallbladder. Besides signals from the septum transversum mesenchyme, fibroblast growth factor from the developing heart also contributes to hepatic competence, along with retinoic acid emanating from the lateral plate mesoderm. The hepatic endodermal cells undergo a morphological transition from columnar to pseudostratified resulting in thickening into the early liver bud. Their expansion forms a population of the bipotential hepatoblasts. Hepatic stellate cells are derived from mesenchyme. After migration of hepatoblasts into the septum transversum mesenchyme, the hepatic architecture begins to be established, with liver sinusoids and bile canaliculi appearing. The liver bud separates into the lobes. The left umbilical vein becomes the ductus venosus and the right vitelline vein becomes the portal vein. The expanding liver bud is colonized by hematopoietic cells. The bipotential hepatoblasts begin differentiating into biliary epithelial cells and hepatocytes. The biliary epithelial cells differentiate from hepatoblasts around portal veins, first producing a monolayer, and then a bilayer of cuboidal cells. In ductal plate, focal dilations emerge at points in the bilayer, become surrounded by portal mesenchyme, and undergo tubulogenesis into intrahepatic bile ducts. Hepatoblasts not adjacent to portal veins instead differentiate into hepatocytes and arrange into cords lined by sinudoidal epithelial cells and bile canaliculi. Once hepatoblasts are specified into hepatocytes and undergo further expansion, they begin acquiring the functions of a mature hepatocyte, and eventually mature hepatocytes appear as highly polarized epithelial cells with abundant glycogen accumulation. In the adult liver, hepatocytes are not equivalent, with position along the portocentrovenular axis within a liver lobule dictating expression of metabolic genes involved in drug metabolism, carbohydrate metabolism, ammonia detoxification, and bile production and secretion. WNT/β-catenin has now been identified to be playing a key role in this phenomenon. At birth, the liver comprises roughly 4% of body weight and weighs on average about 120 g (4 oz). Over the course of further development, it will increase to 1.4–1.6 kg (3.1–3.5 lb) but will only take up 2.5–3.5% of body weight. In the growing fetus, a major source of blood to the liver is the umbilical vein, which supplies nutrients to the growing fetus. The umbilical vein enters the abdomen at the umbilicus and passes upward along the free margin of the falciform ligament of the liver to the inferior surface of the liver. There, it joins with the left branch of the portal vein. The ductus venosus carries blood from the left portal vein to the left hepatic vein and then to the inferior vena cava, allowing placental blood to bypass the liver. In the fetus, the liver does not perform the normal digestive processes and filtration of the infant liver because nutrients are received directly from the mother via the placenta. The fetal liver releases some blood stem cells that migrate to the fetal thymus, creating the T-cells or T-lymphocytes. After birth, the formation of blood stem cells shifts to the red bone marrow. After 2–5 days, the umbilical vein and ductus venosus are completely obliterated; the former becomes the round ligament of liver and the latter becomes the ligamentum venosum. In the disorders of cirrhosis and portal hypertension, the umbilical vein can open up again. The various functions of the liver are carried out by the liver cells or hepatocytes. The liver is thought to be responsible for up to 500 separate functions, usually in combination with other systems and organs. Currently, no artificial organ or device is capable of reproducing all the functions of the liver. Some functions can be carried out by liver dialysis, an experimental treatment for liver failure. The liver also accounts for about 20% of resting total body oxygen consumption. The liver receives a dual blood supply from the hepatic portal vein and hepatic arteries. The hepatic portal vein delivers around 75% of the liver's blood supply, and carries venous blood drained from the spleen, gastrointestinal tract, and its associated organs. The hepatic arteries supply arterial blood to the liver, accounting for the remaining quarter of its blood flow. Oxygen is provided from both sources; about half of the liver's oxygen demand is met by the hepatic portal vein, and half is met by the hepatic arteries. The hepatic artery also has both alpha- and beta-adrenergic receptors; therefore, flow through the artery is controlled, in part, by the splanchnic nerves of the autonomic nervous system. Blood flows through the liver sinusoids and empties into the central vein of each lobule. The central veins coalesce into hepatic veins, which leave the liver and drain into the inferior vena cava. Bile either drains directly into the duodenum via the common bile duct, or is temporarily stored in the gallbladder via the cystic duct. 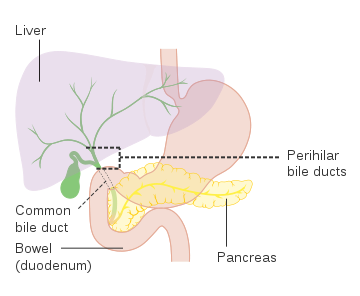 The common bile duct and the pancreatic duct enter the second part of the duodenum together at the hepatopancreatic ampulla, also known as the ampulla of Vater. The liver plays a major role in carbohydrate, protein, amino acid, and lipid metabolism. The liver performs several roles in carbohydrate metabolism: The liver synthesizes and stores around 100 g of glycogen via glycogenesis, the formation of glycogen from glucose. When needed, the liver releases glucose into the blood by performing glycogenolysis, the breakdown of glycogen into glucose. The liver is also responsible for gluconeogenesis, which is the synthesis of glucose from certain amino acids, lactate, or glycerol. Adipose and liver cells produce glycerol by breakdown of fat, which the liver uses for gluconeogenesis. The liver is responsible for the mainstay of protein metabolism, synthesis as well as degradation. It is also responsible for a large part of amino acid synthesis. The liver plays a role in the production of clotting factors, as well as red blood cell production. Some of the proteins synthesized by the liver include coagulation factors I (fibrinogen), II (prothrombin), V, VII, VIII, IX, X, XI, XIII, as well as protein C, protein S and antithrombin. In the first trimester fetus, the liver is the main site of red blood cell production. By the 32nd week of gestation, the bone marrow has almost completely taken over that task. The liver is a major site of production for thrombopoietin, a glycoprotein hormone that regulates the production of platelets by the bone marrow. The liver plays several roles in lipid metabolism: it performs cholesterol synthesis, lipogenesis, and the production of triglycerides, and a bulk of the body's lipoproteins are synthesized in the liver. The liver plays a key role in digestion, as it produces and excretes bile (a yellowish liquid) required for emulsifying fats and help the absorption of vitamin K from the diet. Some of the bile drains directly into the duodenum, and some is stored in the gallbladder. The liver also produces insulin-like growth factor 1, a polypeptide protein hormone that plays an important role in childhood growth and continues to have anabolic effects in adults. The liver is responsible for the breakdown of insulin and other hormones. The liver breaks down bilirubin via glucuronidation, facilitating its excretion into bile. The liver is responsible for the breakdown and excretion of many waste products. It plays a key role in breaking down or modifying toxic substances (e.g., methylation) and most medicinal products in a process called drug metabolism. This sometimes results in toxication, when the metabolite is more toxic than its precursor. Preferably, the toxins are conjugated to avail excretion in bile or urine. The liver breaks down ammonia into urea as part of the urea cycle, and the urea is excreted in the urine. The liver stores a multitude of substances, including glucose (in the form of glycogen), vitamin A (1–2 years' supply), vitamin D (1–4 months' supply), vitamin B12 (3–5 years' supply), vitamin K, iron, and copper. The liver is responsible for immunological effects – the mononuclear phagocyte system of the liver contains many immunologically active cells, acting as a 'sieve' for antigens carried to it via the portal system. The liver produces albumin, the most abundant protein in blood serum. It is essential in the maintenance of oncotic pressure, and acts as a transport for fatty acids and steroid hormones. The liver synthesizes angiotensinogen, a hormone that is responsible for raising the blood pressure when activated by renin, an enzyme that is released when the kidney senses low blood pressure. The liver produces the enzyme catalase in order to break down hydrogen peroxide, a very toxic substance due to it being a powerful oxidising agent, into water and oxygen. The oxidative capacity of the liver decreases with aging and therefore any medications that require oxidation (for instance, benzodiazepines) are more likely to accumulate to toxic levels. However, medications with shorter half-lives, such as lorazepam and oxazepam, are preferred in most cases when benzodiazepines are required in regard to geriatric medicine. The liver is a vital organ and supports almost every other organ in the body. Because of its strategic location and multidimensional functions, the liver is also prone to many diseases. The bare area of the liver is a site that is vulnerable to the passing of infection from the abdominal cavity to the thoracic cavity. Hepatitis is a common condition of inflammation of the liver. The most usual cause of this is viral, and the most common of these infections are hepatitis A, B, C, D, and E. Some of these infections are sexually transmitted. Inflammation can also be caused by other viruses in the family Herpesviridae such as the herpes simplex virus. Chronic (rather than acute) infection with hepatitis B virus or hepatitis C virus is the main cause of liver cancer. Globally, about 248 million individuals are chronically infected with HBV (with 843,724 in the U.S.) and 142 million are chronically infected with HCV (with 2.7 million in the U.S.). Globally there are about 114 million and 20 million cases of hepatitis A and hepatitis E respectively, but these generally resolve, and do not become chronic. Hepatitis D virus is a "satellite" of hepatitis B virus (can only infect in the presence of hepatitis B), and co-infects nearly 20 million people with hepatitis B, globally. Hepatic encephalopathy is caused by an accumulation of toxins in the bloodstream that are normally removed by the liver. This condition can result in coma and can prove fatal. Other disorders caused by excessive alcohol consumption are grouped under alcoholic liver diseases and these include alcoholic hepatitis, fatty liver, and cirrhosis. Factors contributing to the development of alcoholic liver diseases are not only the quantity and frequency of alcohol consumption, but can also include gender, genetics, and liver insult. Liver damage can also be caused by drugs, particularly paracetamol and drugs used to treat cancer. A rupture of the liver can be caused by a liver shot used in combat sports. Budd–Chiari syndrome is a condition caused by blockage of the hepatic veins (including thrombosis) that drain the liver. It presents with the classical triad of abdominal pain, ascites and liver enlargement. Primary biliary cholangitis is an autoimmune disease of the liver. It is marked by slow progressive destruction of the small bile ducts of the liver, with the intralobular ducts (Canals of Hering) affected early in the disease. When these ducts are damaged, bile and other toxins build up in the liver (cholestasis) and over time damages the liver tissue in combination with ongoing immune related damage. This can lead to scarring (fibrosis) and cirrhosis. Cirrhosis increases the resistance to blood flow in the liver, and can result in portal hypertension. Congested anastomoses between the portal venous system and the systemic circulation, can be a subsequent condition. There are also many pediatric liver diseases, including biliary atresia, alpha-1 antitrypsin deficiency, alagille syndrome, progressive familial intrahepatic cholestasis, Langerhans cell histiocytosis and hepatic hemangioma a benign tumour the most common type of liver tumour, thought to be congenital. A genetic disorder causing multiple cysts to form in the liver tissue, usually in later life, and usually asymptomatic, is polycystic liver disease. Diseases that interfere with liver function will lead to derangement of these processes. However, the liver has a great capacity to regenerate and has a large reserve capacity. In most cases, the liver only produces symptoms after extensive damage. Hepatomegaly refers to an enlarged liver and can be due to many causes. It can be palpated in a liver span measurement. Liver diseases may be diagnosed by liver function tests–blood tests that can identify various markers. For example, acute-phase reactants are produced by the liver in response to injury or inflammation. Swelling of the abdomen, and swelling of the ankles and feet occurs because the liver fails to make albumin. Excessive fatigue occurs from a generalized loss of nutrients, minerals and vitamins. Bruising and easy bleeding are other features of liver disease. The liver makes clotting factors, substances which help prevent bleeding. When liver damage occurs, these factors are no longer present and severe bleeding can occur. Pain in the upper right quadrant can result from the stretching of Glisson's capsule in conditions of hepatitis and pre-eclampsia. The diagnosis of liver disease is made by liver function tests, groups of blood tests, that can readily show the extent of liver damage. If infection is suspected, then other serological tests will be carried out. A physical examination of the liver can only reveal its size and any tenderness, and some form of imaging such as an ultrasound or CT scan may also be needed. Sometimes a liver biopsy will be necessary, and a tissue sample is taken through a needle inserted into the skin just below the rib cage. This procedure may be helped by a sonographer providing ultrasound guidance to an interventional radiologist. Axial CT image showing anomalous hepatic veins coursing on the subcapsular anterior surface of the liver. A CT scan in which the liver and portal vein are shown. The liver is the only human internal organ capable of natural regeneration of lost tissue; as little as 25% of a liver can regenerate into a whole liver. This is, however, not true regeneration but rather compensatory growth in mammals. The lobes that are removed do not regrow and the growth of the liver is a restoration of function, not original form. This contrasts with true regeneration where both original function and form are restored. In some other species, such as fish, the liver undergoes true regeneration by restoring both shape and size of the organ. In the liver, large areas of the tissues are formed but for the formation of new cells there must be sufficient amount of material so the circulation of the blood becomes more active. This is predominantly due to the hepatocytes re-entering the cell cycle. That is, the hepatocytes go from the quiescent G0 phase to the G1 phase and undergo mitosis. This process is activated by the p75 receptors. There is also some evidence of bipotential stem cells, called hepatic oval cells or ovalocytes (not to be confused with oval red blood cells of ovalocytosis), which are thought to reside in the canals of Hering. These cells can differentiate into either hepatocytes or cholangiocytes. Cholangiocytes are the epithelial lining cells of the bile ducts. They are cuboidal epithelium in the small interlobular bile ducts, but become columnar and mucus secreting in larger bile ducts approaching the porta hepatis and the extrahepatic ducts. Research is being carried out on the use of stem cells for the generation of an artificial liver. Scientific and medical works about liver regeneration often refer to the Greek Titan Prometheus who was chained to a rock in the Caucasus where, each day, his liver was devoured by an eagle, only to grow back each night. The myth suggests the ancient Greeks may have known about the liver’s remarkable capacity for self-repair. Human liver transplants were first performed by Thomas Starzl in the United States and Roy Calne in Cambridge, England in 1963 and 1967, respectively. Liver transplantation is the only option for those with irreversible liver failure. Most transplants are done for chronic liver diseases leading to cirrhosis, such as chronic hepatitis C, alcoholism, and autoimmune hepatitis. Less commonly, liver transplantation is done for fulminant hepatic failure, in which liver failure occurs over days to weeks. Liver allografts for transplant usually come from donors who have died from fatal brain injury. Living donor liver transplantation is a technique in which a portion of a living person's liver is removed (hepatectomy) and used to replace the entire liver of the recipient. This was first performed in 1989 for pediatric liver transplantation. Only 20 percent of an adult's liver (Couinaud segments 2 and 3) is needed to serve as a liver allograft for an infant or small child. More recently, adult-to-adult liver transplantation has been done using the donor's right hepatic lobe, which amounts to 60 percent of the liver. Due to the ability of the liver to regenerate, both the donor and recipient end up with normal liver function if all goes well. This procedure is more controversial, as it entails performing a much larger operation on the donor, and indeed there have been at least two donor deaths out of the first several hundred cases. A recent publication has addressed the problem of donor mortality, and at least 14 cases have been found. The risk of postoperative complications (and death) is far greater in right-sided operations than that in left-sided operations. With the recent advances of noninvasive imaging, living liver donors usually have to undergo imaging examinations for liver anatomy to decide if the anatomy is feasible for donation. The evaluation is usually performed by multidetector row computed tomography (MDCT) and magnetic resonance imaging (MRI). MDCT is good in vascular anatomy and volumetry. MRI is used for biliary tree anatomy. Donors with very unusual vascular anatomy, which makes them unsuitable for donation, could be screened out to avoid unnecessary operations. MDCT image. 3D image created by MDCT can clearly visualize the liver, measure the liver volume, and plan the dissection plane to facilitate the liver transplantation procedure. Phase contrast CT image. Contrast is perfusing the right liver but not the left due to a left portal vein thrombus. Some cultures regard the liver as the seat of the soul. In Greek mythology, the gods punished Prometheus for revealing fire to humans by chaining him to a rock where a vulture (or an eagle) would peck out his liver, which would regenerate overnight. (The liver is the only human internal organ that actually can regenerate itself to a significant extent.) Many ancient peoples of the Near East and Mediterranean areas practiced a type of divination called haruspicy or hepatomancy, where they tried to obtain information by examining the livers of sheep and other animals. In Plato, and in later physiology, the liver was thought to be the seat of the darkest emotions (specifically wrath, jealousy and greed) which drive men to action. The Talmud (tractate Berakhot 61b) refers to the liver as the seat of anger, with the gallbladder counteracting this. The Persian, Urdu, and Hindi languages (جگر or जिगर or jigar) refer to the liver figurative speech to indicate courage and strong feelings, or "their best"; e.g., "This Mecca has thrown to you the pieces of its liver!". The term jan e jigar, literally "the strength (power) of my liver", is a term of endearment in Urdu. In Persian slang, jigar is used as an adjective for any object which is desirable, especially women. In the Zulu language, the word for liver (isibindi) is the same as the word for courage. The legend of Liver-Eating Johnson (died 1900) says that he would cut out and eat the liver of each man killed after dinner. In the motion picture The Message, Hind bint Utbah is implied or portrayed eating the liver of Hamza ibn ‘Abd al-Muttalib during the Battle of Uhud in 624. There are narrations that suggest that Hind "tasted" (rather than ate) the liver of Hamza. On November 26, 1987, the city of Ferrol, Spain, inaugurated what is believed to be the only monument to the liver in the world. The then-mayor, Jaime Quintanilla, also happened to be a doctor, and thought it appropriate to promote the monument. At an approximate cost of $3200, the monument stands in the village of Balón. A plaque reads (in Galician, free translation): "The Liver [is the] basis of Life", and below "Through History, Mankind tried to cure all illness. By helping it on this duty, you are doing a great job. We are grateful for it". Humans commonly eat the livers of mammals, fowl, and fish as food. Domestic pig, ox, lamb, calf, chicken, and goose livers are widely available from butchers and supermarkets. In the Romance languages, the anatomical word for "liver" (French foie, Spanish hígado, etc.) derives not from the Latin anatomical term, jecur, but from the culinary term ficatum, literally "stuffed with figs," referring to the livers of geese that had been fattened on figs. Liver can be baked, boiled, broiled, fried, stir-fried, or eaten raw (asbeh nayeh or sawda naye in Lebanese cuisine, or liver sashimi in Japanese cuisine. In many preparations, pieces of liver are combined with pieces of meat or kidneys, as in the various forms of Middle Eastern mixed grill (e.g. meurav Yerushalmi). Well-known examples include liver pâté, foie gras, chopped liver, and leverpastej. Liver sausages such as Braunschweiger and liverwurst are also a valued meal. Liver sausages may also be used as spreads. A traditional South African delicacy, skilpadjies, is made of minced lamb's liver wrapped in netvet (caul fat), and grilled over an open fire. Animal livers are rich in iron, vitamin A and vitamin B12; and cod liver oil is commonly used as a dietary supplement. Traditionally, some fish livers were valued as food, especially the stingray liver. It was used to prepare delicacies, such as poached skate liver on toast in England, as well as the beignets de foie de raie and foie de raie en croute in French cuisine. It is said that a person, once he has drunk umm nyolokh, will return to giraffe again and again. Humr, being Mahdists, are strict abstainers [ from alcohol ] and a Humrawi is never drunk ( sakran ) on liquor or beer. But he uses this word to describe the effects which umm nyolokh has upon him. I can only assume that there is no intoxicating substance in the drink and that the effect it produces is simply a matter of convention, although it may be brought about subconsciously. The study of entheogens in general - including entheogens of animal origin ( e.g. hallucinogenic fish and toad venom ) - has, however made considerable progress in the sixty-odd years since Cunnison's report and the idea that some intoxicating principle might reside in giraffe liver no longer seems as far-fetched as it was in Cunnison's day, although conclusive proof ( or disproof ) will have to await detailed analyses of the animal organ in question and the drink prepared therefrom. S. M. Shirokogoroff, who, in 1935, noted the use of a liver-based arrow poison by the Tungusic Kumarčen people. Formerly the using of poisoned arrows was common. For instance, among the Kumarčen, [ a subgroup of the Oroqen ] even in recent times a poison was used which was prepared from decaying liver. * ( Note ) This has been confirmed by the Kumarčen. I am not competent to judge as to the chemical conditions of production of poison which is not destroyed by the heat of explosion. However, the Tungus themselves compare this method [ of poisoning ammunition ] with the poisoning of arrows. The liver is found in all vertebrates, and is typically the largest visceral (internal) organ. Its form varies considerably in different species, and is largely determined by the shape and arrangement of the surrounding organs. Nonetheless, in most species it is divided into right and left lobes; exceptions to this general rule include snakes, where the shape of the body necessitates a simple cigar-like form. The internal structure of the liver is broadly similar in all vertebrates. ^ Elias, H.; Bengelsdorf, H. (1 July 1952). "The Structure of the Liver in Vertebrates". Cells Tissues Organs. 14 (4): 297–337. doi:10.1159/000140715. ^ Abdel-Misih, Sherif R.Z. ; Bloomston, Mark (2010). "Liver Anatomy". Surgical Clinics of North America. 90 (4): 643–653. doi:10.1016/j.suc.2010.04.017. PMC 4038911. PMID 20637938. ^ a b c "Anatomy and physiology of the liver – Canadian Cancer Society". Cancer.ca. Retrieved 2015-06-26. ^ a b Tortora, Gerard J.; Derrickson, Bryan H. (2008). Principles of Anatomy and Physiology (12th ed.). John Wiley & Sons. p. 945. ISBN 978-0-470-08471-7. ^ Maton, Anthea; Jean Hopkins; Charles William McLaughlin; Susan Johnson; Maryanna Quon Warner; David LaHart; Jill D. Wright (1993). Human Biology and Health. Englewood Cliffs, New Jersey, USA: Prentice Hall. ISBN 978-0-13-981176-0. OCLC 32308337. ^ Zakim, David; Boyer, Thomas D. (2002). Hepatology: A Textbook of Liver Disease (4th ed.). ISBN 9780721690513. ^ "Etymology online hepatic". Retrieved December 12, 2013. ^ Cotran, Ramzi S.; Kumar, Vinay; Fausto, Nelson; Nelso Fausto; Robbins, Stanley L.; Abbas, Abul K. (2005). Robbins and Cotran pathologic basis of disease (7th ed.). St. Louis, MO: Elsevier Saunders. p. 878. ISBN 978-0-7216-0187-8. ^ "Enlarged liver". Mayo Clinic. Retrieved 2017-03-29. ^ "Anatomy of the Liver". Liver.co.uk. Retrieved 2015-06-26. ^ Renz, John F.; Kinkhabwala, Milan (2014). "Surgical Anatomy of the Liver". In Busuttil, Ronald W.; Klintmalm, Göran B. (eds.). Transplantation of the Liver. Elsevier. pp. 23–39. ISBN 978-1-4557-5383-3. ^ "Cantlie's line | Radiology Reference Article". Radiopaedia.org. Retrieved 2015-06-26. ^ Kuntz, Erwin; Kuntz, Hans-Dieter (2009). "Liver resection". Hepatology: Textbook and Atlas (3rd ed.). Springer. pp. 900–903. ISBN 978-3-540-76839-5. ^ a b Singh, Inderbir (2008). "The Liver Pancreas and Spleen". Textbook of Anatomy with Colour Atlas. Jaypee Brothers. pp. 592–606. ISBN 978-81-8061-833-8. ^ a b McMinn, R.M.H. (2003). "Liver and Biliary Tract". Last's Anatomy: Regional and Applied. Elsevier. pp. 342–351. ISBN 978-0-7295-3752-0. ^ Skandalakis, Lee J.; Skandalakis, John E.; Skandalakis, Panajiotis N. (2009). "Liver". Surgical Anatomy and Technique: A Pocket Manual. pp. 497–531. doi:10.1007/978-0-387-09515-8_13. ISBN 978-0-387-09515-8. ^ a b c Dorland's illustrated medical dictionary 2012, p. 925. ^ a b c Human Anatomy & Physiology + New Masteringa&p With Pearson Etext. Benjamin-Cummings Pub Co. 2012. ISBN 9780321852120. ^ a b c Human Anatomy & Physiology + New Masteringa&p With Pearson Etext. Benjamin-Cummings Pub Co. 2012. p. 881. ISBN 9780321852120. ^ a b c Kmieć Z (2001). Cooperation of liver cells in health and disease. Adv Anat Embryol Cell Biol. Advances in Anatomy Embryology and Cell Biology. 161. pp. iii–xiii, 1–151. doi:10.1007/978-3-642-56553-3_1. ISBN 978-3-540-41887-0. PMID 11729749. ^ Pocock, Gillian (2006). Human Physiology (Third ed.). Oxford University Press. p. 404. ISBN 978-0-19-856878-0. ^ a b Kawarada, Y; Das, BC; Taoka, H (2000). "Anatomy of the hepatic hilar area: the plate system". Journal of Hepato-Biliary-Pancreatic Surgery. 7 (6): 580–586. doi:10.1007/s005340050237 (inactive 2019-03-14). PMID 11180890. ^ a b "Couinaud classification | Radiology Reference Article". Radiopaedia.org. Retrieved 2015-06-26. ^ "Three-dimensional Anatomy of the Couinaud Liver Segments". Retrieved 2009-02-17. ^ Strunk, H.; Stuckmann, G.; Textor, J.; Willinek, W. (2003). "Limitations and pitfalls of Couinaud's segmentation of the liver in transaxial Imaging". European Radiology. 13 (11): 2472–2482. doi:10.1007/s00330-003-1885-9. PMID 12728331. ^ a b "The Radiology Assistant : Anatomy of the liver segments". Radiologyassistant.nl. 2006-05-07. Retrieved 2015-06-26. ^ "The human proteome in liver – The Human Protein Atlas". www.proteinatlas.org. Retrieved 2017-09-21. ^ Kampf, Caroline; Mardinoglu, Adil; Fagerberg, Linn; Hallström, Björn M.; Edlund, Karolina; Lundberg, Emma; Pontén, Fredrik; Nielsen, Jens; Uhlen, Mathias (2014-07-01). "The human liver-specific proteome defined by transcriptomics and antibody-based profiling". The FASEB Journal. 28 (7): 2901–2914. doi:10.1096/fj.14-250555. ISSN 0892-6638. PMID 24648543. ^ Gilbert SF (2000). Developmental Biology (6th ed.). Sunderland (MA): Sinauer Associates. ^ a b Lade AG, Monga SP (2011). "Beta-catenin signaling in hepatic development and progenitors: which way does the WNT blow?". Dev Dyn. 240 (3): 486–500. doi:10.1002/dvdy.22522. PMC 4444432. PMID 21337461. ^ Berg T, DeLanghe S, Al Alam D, Utley S, Estrada J, Wang KS (2010). "β-catenin regulates mesenchymal progenitor cell differentiation during hepatogenesis". J Surg Res. 164 (2): 276–285. doi:10.1016/j.jss.2009.10.033. PMC 2904820. PMID 20381814. ^ Clemente, Carmin D. (2011). Anatomy a Regional Atlas of the Human Body. Philadelphia: Lippincott Williams & Wilkins. p. 243. ISBN 978-1-58255-889-9. ^ Shneider, Benjamin L.; Sherman, Philip M. (2008). Pediatric Gastrointestinal Disease. Connecticut: PMPH-USA. p. 751. ISBN 978-1-55009-364-3. ^ a b Human Anatomy & Physiology + New Masteringa&p With Pearson Etext. Benjamin-Cummings Pub Co. 2012. p. 939. ISBN 9780321852120. ^ Jelkmann, Wolfgang (2001). "The role of the liver in the production of thrombopoietin compared with erythropoietin". European Journal of Gastroenterology & Hepatology. 13 (7): 791–801. doi:10.1097/00042737-200107000-00006. PMID 11474308. ^ "If a person stops consuming the vitamin, the body's stores of this vitamin usually take about 3 to 5 years to exhaust". ^ Hepatitis A, B, and C Center: Symptoms, Causes, Tests, Transmission, and Treatments. Webmd.com (2005-08-19). Retrieved on 2016-05-10. ^ Schweitzer A, Horn J, Mikolajczyk RT, Krause G, Ott JJ (2015). "Estimations of worldwide prevalence of chronic hepatitis B virus infection: a systematic review of data published between 1965 and 2013". Lancet. 386 (10003): 1546–1555. doi:10.1016/S0140-6736(15)61412-X. PMID 26231459. ^ a b Vos, Theo; Allen, Christine; Arora, Megha; Barber, Ryan M.; Bhutta, Zulfiqar A.; Brown, Alexandria; Carter, Austin; Casey, Daniel C.; Charlson, Fiona J.; Chen, Alan Z.; Coggeshall, Megan; Cornaby, Leslie; Dandona, Lalit; Dicker, Daniel J.; Dilegge, Tina; Erskine, Holly E.; Ferrari, Alize J.; Fitzmaurice, Christina; Fleming, Tom; Forouzanfar, Mohammad H.; Fullman, Nancy; Gething, Peter W.; Goldberg, Ellen M.; Graetz, Nicholas; Haagsma, Juanita A.; Hay, Simon I.; Johnson, Catherine O.; Kassebaum, Nicholas J.; Kawashima, Toana; et al. (2016). "Global, regional, and national incidence, prevalence, and years lived with disability for 310 diseases and injuries, 1990-2015: a systematic analysis for the Global Burden of Disease Study 2015". Lancet. 388 (10053): 1545–1602. doi:10.1016/S0140-6736(16)31678-6. PMC 5055577. PMID 27733282. ^ "WHO | Hepatitis E". ^ Dény P (2006). "Hepatitis delta virus genetic variability: from genotypes I, II, III to eight major clades?". Curr. Top. Microbiol. Immunol. 307: 151–171. PMID 16903225. ^ Rajani R, Melin T, Björnsson E, Broomé U, Sangfelt P, Danielsson A, Gustavsson A, Grip O, Svensson H, Lööf L, Wallerstedt S, Almer SH (Feb 2009). "Budd-Chiari syndrome in Sweden: epidemiology, clinical characteristics and survival – an 18-year experience". Liver International. 29 (2): 253–259. doi:10.1111/j.1478-3231.2008.01838.x. PMID 18694401. ^ Hirschfield, GM; Gershwin, ME (Jan 24, 2013). "The immunobiology and pathophysiology of primary biliary cirrhosis". Annual Review of Pathology. 8: 303–330. doi:10.1146/annurev-pathol-020712-164014. PMID 23347352. ^ Dancygier, Henryk (2010). Clinical Hepatology Principles and Practice of. Springer. pp. 895–. ISBN 978-3-642-04509-7. Retrieved 29 June 2010. ^ Saxena, Romil; Theise, Neil (2004). "Canals of Hering: Recent Insights and Current Knowledge". Seminars in Liver Disease. 24 (1): 43–48. doi:10.1055/s-2004-823100. PMID 15085485. ^ Ghent, Cam N (2009). "Who should be performing liver biopsies?". Canadian Journal of Gastroenterology. 23 (6): 437–438. doi:10.1155/2009/756584. PMC 2721812. PMID 19543575. ^ Sheporaitis, L; Freeny, PC (1998). "Hepatic and portal surface veins: A new anatomic variant revealed during abdominal CT". AJR. American Journal of Roentgenology. 171 (6): 1559–1564. doi:10.2214/ajr.171.6.9843288. PMID 9843288. ^ Häussinger, Dieter, ed. (2011). Liver Regeneration. Berlin: De Gruyter. p. 1. ISBN 9783110250794. ^ Kumar, Vinay; Abbas, Abul K.; Fausto, Nelson (1999). Robbins and Cotran Pathologic Basis of Disease (7th ed.). p. 101. ISBN 978-0-8089-2302-2. ^ Chu, Jaime; Sadler, Kirsten C. (2009). "New school in liver development: Lessons from zebrafish". Hepatology. 50 (5): 1656–1663. doi:10.1002/hep.23157. PMC 3093159. PMID 19693947. ^ W.T. Councilman (1913). "Two". Disease and Its Causes. New York Henry Holt and Company London Williams and Norgate The University Press, Cambridge, MA. ^ Suzuki K, Tanaka M, Watanabe N, Saito S, Nonaka H, Miyajima A (2008). "p75 Neurotrophin receptor is a marker for precursors of stellate cells and portal fibroblasts in mouse fetal liver". Gastroenterology. 135 (1): 270–281.e3. doi:10.1053/j.gastro.2008.03.075. PMID 18515089. ^ Tietz PS, Larusso NF (May 2006). "Cholangiocyte biology". Current Opinion in Gastroenterology. 22 (3): 279–287. doi:10.1097/01.mog.0000218965.78558.bc. PMID 16550043. ^ An argument for the ancient Greek’s knowing about liver regeneration is provided by Chen, T.S. ; Chen, P.S. (1994). "The myth of Prometheus and the liver". Journal of the Royal Society of Medicine. 87 (12): 754–755. PMC 1294986. PMID 7853302. Counterarguments are provided by Tiniakos, D.G. ; Kandilis, A.; Geller, S.A. (2010). "Tityus: A forgotten myth of liver regeneration". Journal of Hepatology. 53 (2): 357–361. doi:10.1016/j.jhep.2010.02.032. PMID 20472318. and by Power, C.; Rasko, J.E. (2008). "Whither prometheus' liver? Greek myth and the science of regeneration". Annals of Internal Medicine. 149 (6): 421–426. CiteSeerX 10.1.1.689.8218. doi:10.7326/0003-4819-149-6-200809160-00009. PMID 18794562. ^ Bramstedt K (2006). "Living liver donor mortality: where do we stand?". Am. J. Gastroenterol. 101 (4): 755–759. doi:10.1111/j.1572-0241.2006.00421.x. PMID 16494593. ^ Spence, Lewis (1916). "10: The Magic and Demonology of Babylonia and Assyria". Myths and Legends of Babylonia and Assyria. Cosimo Classics. New York: Cosimo, Inc. (published 2010). p. 281. Retrieved 2018-09-16. Now among people in a primitive state of culture the soul is almost invariably supposed to reside in the liver instead of in the heart or brain. ^ Krishna, Gopi; Hillman, James (1970). Kundalini – the evolutionary energy in man. London: Stuart & Watkins. p. 77. ISBN 978-1570622809. Archived from the original on 2016-03-05. ^ The Great Battle Of Badar (Yaum-E-Furqan). Shawuniversitymosque.org (2006-07-08). Retrieved 2013-03-19. ^ "La Voz de Galicia "Ferrol monument mentioned in US newspaper" 07/30/2015"". ^ "Foie". Larousse.fr. Retrieved 2019-04-16. ^ Schwabe, Calvin W. (1979). Unmentionable Cuisine. University of Virginia Press. pp. 313–. ISBN 978-0-8139-1162-5. ^ a b c Rudgley, Richard The Encyclopedia of Psychoactive Substances , pub. Abacus 1998 ISBN 0 349 11127 8 pps. 20-21. ^ a b Cunnison, Ian 1958 Giraffe Hunting among the Humr Tribe, SNR 39, pps. 49-60. ^ Shirokogoroff S.M., Psychomental Complex of the Tungus, pub. Kegan Paul, Trench, Trubner & Co., Ltd. 1935 p. 89. ^ Romer, Alfred Sherwood; Parsons, Thomas S. (1977). The Vertebrate Body. Philadelphia: Holt-Saunders International. pp. 354–355. ISBN 978-0-03-910284-5. ^ Yuan, Shaochun; Ruan, Jie; Huang, Shengfeng; Chen, Shangwu; Xu, Anlong (2015). "Amphioxus as a model for investigating evolution of the vertebrate immune system" (PDF). Developmental & Comparative Immunology. 48 (2): 297–305. doi:10.1016/j.dci.2014.05.004. PMID 24877655. Archived from the original (PDF) on 2015-12-22. ^ Yu, Jr-Kai Sky; Lecroisey, Claire; Le Pétillon, Yann; Escriva, Hector; Lammert, Eckhard; Laudet, Vincent (2015). "Identification, Evolution and Expression of an Insulin-Like Peptide in the Cephalochordate Branchiostoma lanceolatum". PLoS ONE. 10 (3): e0119461. doi:10.1371/journal.pone.0119461. PMC 4361685. PMID 25774519. ^ Escriva, Hector; Chao, Yeqing; Fan, Chunxin; Liang, Yujun; Gao, Bei; Zhang, Shicui (2012). "A Novel Serpin with Antithrombin-Like Activity in Branchiostoma japonicum: Implications for the Presence of a Primitive Coagulation System". PLoS ONE. 7 (3): e32392. doi:10.1371/journal.pone.0032392. PMC 3299649. PMID 22427833. ^ Guo, Bin; Zhang, Shicui; Wang, Shaohui; Liang, Yujun (2009). "Expression, mitogenic activity and regulation by growth hormone of growth hormone/insulin-like growth factor in Branchiostoma belcheri". Cell and Tissue Research. 338 (1): 67–77. doi:10.1007/s00441-009-0824-8. PMID 19657677. Dorland's illustrated medical dictionary (32nd ed.). Philadelphia: Elsevier/Saunders. 2012. ISBN 978-1-4557-0985-4. Cirrhosis is a condition in which the liver does not function properly due to long-term damage. This damage is characterized by the replacement of normal liver tissue by scar tissue. Typically, the disease develops slowly over months or years. Early on, there are often no symptoms. As the disease worsens, a person may become tired, weak, itchy, have swelling in the lower legs, develop yellow skin, bruise easily, have fluid build up in the abdomen, or develop spider-like blood vessels on the skin. The fluid build-up in the abdomen may become spontaneously infected. Other serious complications include hepatic encephalopathy, bleeding from dilated veins in the esophagus or dilated stomach veins, and liver cancer. Hepatic encephalopathy results in confusion and may lead to unconsciousness.Cirrhosis is most commonly caused by alcohol, hepatitis B, hepatitis C, and non-alcoholic fatty liver disease. Typically, more than two or three alcoholic drinks per day over a number of years is required for alcoholic cirrhosis to occur. Non-alcoholic fatty liver disease has a number of causes, including being overweight, diabetes, high blood fats, and high blood pressure. A number of less common causes of cirrhosis include autoimmune hepatitis, primary biliary cholangitis, hemochromatosis, certain medications, and gallstones. Diagnosis is based on blood testing, medical imaging, and liver biopsy.Some causes of cirrhosis, such as hepatitis B, can be prevented by vaccination. Treatment partly depends on the underlying cause, but the goal is often to prevent worsening and complications. Avoiding alcohol is recommended in all cases of cirrhosis. Hepatitis B and C may be treatable with antiviral medications. Autoimmune hepatitis may be treated with steroid medications. Ursodiol may be useful if the disease is due to blockage of the bile ducts. Other medications may be useful for complications such as abdominal or leg swelling, hepatic encephalopathy, and dilated esophageal veins. In severe cirrhosis, a liver transplant may be an option.Cirrhosis affected about 2.8 million people and resulted in 1.3 million deaths in 2015. Of these deaths, alcohol caused 348,000, hepatitis C caused 326,000, and hepatitis B caused 371,000. In the United States, more men die of cirrhosis than women. The first known description of the condition is by Hippocrates in the 5th century BCE. The word cirrhosis is from Greek: κίρρωσις; kirrhos κιρρός "yellowish" and -osis (-ωσις) meaning "condition", describing the appearance of a cirrhotic liver. Cod liver oil is a dietary supplement derived from liver of cod fish (Gadidae). As with most fish oils, it contains the omega-3 fatty acids, eicosapentaenoic acid (EPA) and docosahexaenoic acid (DHA). Cod liver oil also contains vitamin A and vitamin D. Historically, it was given to children because vitamin D had been shown to prevent rickets, a consequence of vitamin D deficiency. Fatty liver disease (FLD), also known as hepatic steatosis, is a condition where excess fat builds up in the liver.There are two types: non-alcoholic fatty liver disease (NAFLD) and alcoholic liver disease. NAFLD is made up of simple fatty liver and non-alcoholic steatohepatitis (NASH). Risk factors for NAFLD include diabetes, obesity, and older age.The condition is also associated with other diseases that influence fat metabolism. It is difficult to distinguish alcoholic FLD, which is part of alcoholic liver disease, from nonalcoholic FLD (NAFLD), and both show microvesicular and macrovesicular fatty changes at different stages. Foie gras (English: (listen), French: [fwa ɡʁɑ]; French for "fat liver") is considered a luxury food product made of the liver of a duck or goose that has been especially fattened. By French law, foie gras is defined as the liver of a duck or goose fattened by force-feeding corn with a feeding tube, a process also known as gavage. In Spain and other countries, it is occasionally produced using natural feeding. Ducks are force-fed twice a day for 12.5 days and geese three times a day for around 17 days. Ducks are typically slaughtered at 100 days and geese at 112 days.Foie gras is a popular and well-known delicacy in French cuisine. Its flavor is described as rich, buttery, and delicate, unlike that of an ordinary duck or goose liver. Foie gras is sold whole, or is prepared into mousse, parfait, or pâté, and may also be served as an accompaniment to another food item, such as steak. French law states that "Foie gras belongs to the protected cultural and gastronomical heritage of France. "The technique of gavage dates as far back as 2500 BC, when the ancient Egyptians began keeping birds for food and deliberately fattened the birds through force-feeding. Today, France is by far the largest producer and consumer of foie gras, though it is produced and consumed worldwide, particularly in other European nations, the United States, and China.Gavage-based foie gras production is controversial, due mainly to the animal welfare concerns about force-feeding, intensive housing and husbandry, and enlarging the liver to 10 times its usual volume. A number of countries and jurisdictions have laws against force-feeding, and the production, import or sale of foie gras; even where it is legal, a number of retailers decline to stock it. Glycogen functions as one of two forms of long-term energy reserves, with the other form being triglyceride stores in adipose tissue (i.e., body fat). In humans, glycogen is made and stored primarily in the cells of the liver and skeletal muscle. In the liver, glycogen can make up 5–6% of the organ's fresh weight, and the liver of an adult weighing 70 kg can store roughly 100–120 grams of glycogen. In skeletal muscle, glycogen is found in a low concentration (1–2% of the muscle mass) and the skeletal muscle of an adult weighing 70 kg stores roughly 400 grams of glycogen. The amount of glycogen stored in the body—particularly within the muscles and liver—mostly depends on physical training, basal metabolic rate, and eating habits. Small amounts of glycogen are also found in other tissues and cells, including the kidneys, red blood cells, white blood cells, and glial cells in the brain. The uterus also stores glycogen during pregnancy to nourish the embryo.Approximately 4 grams of glucose are present in the blood of humans at all times; in fasted individuals, blood glucose is maintained constant at this level at the expense of glycogen stores in the liver and skeletal muscle. Glycogen stores in skeletal muscle serve as a form of energy storage for the muscle itself; however, the breakdown of muscle glycogen impedes muscle glucose uptake, thereby increasing the amount of blood glucose available for use in other tissues. Liver glycogen stores serve as a store of glucose for use throughout the body, particularly the central nervous system. The human brain consumes approximately 60% of blood glucose in fasted, sedentary individuals.Glycogen is the analogue of starch, a glucose polymer that functions as energy storage in plants. It has a structure similar to amylopectin (a component of starch), but is more extensively branched and compact than starch. Both are white powders in their dry state. Glycogen is found in the form of granules in the cytosol/cytoplasm in many cell types, and plays an important role in the glucose cycle. Glycogen forms an energy reserve that can be quickly mobilized to meet a sudden need for glucose, but one that is less compact than the energy reserves of triglycerides (lipids). As such it is also found as storage reserve in many parasitic protozoa. Hepatic encephalopathy (HE) is an altered level of consciousness as a result of liver failure. Onset may be gradual or sudden. Other symptoms may include movement problems, changes in mood, or changes in personality. In the advanced stages it can result in a coma.Hepatic encephalopathy can occur in those with acute or chronic liver disease. Episodes can be triggered by infections, GI bleeding, constipation, electrolyte problems, or certain medications. The underlying mechanism is believed to involve the buildup of ammonia in the blood, a substance that is normally removed by the liver. The diagnosis is typically made after ruling out other potential causes. It may be supported by blood ammonia levels, an electroencephalogram, or a CT scan of the brain.Hepatic encephalopathy is possibly reversible with treatment. This typically involves supportive care and addressing the triggers of the event. Lactulose is frequently used to decrease ammonia levels. Certain antibiotics and probiotics are other potential options. A liver transplant may improve outcomes in those with severe disease.More than 40% of people with cirrhosis develop hepatic encephalopathy. More than half of those with cirrhosis and significant HE live less than a year. In those who are able to get a liver transplant, the risk of death is less than 30% over the subsequent five years. The condition has been described since at least 1860. Hepatitis is inflammation of the liver tissue. Some people have no symptoms whereas others develop yellow discoloration of the skin and whites of the eyes, poor appetite, vomiting, tiredness, abdominal pain, or diarrhea. Hepatitis may be temporary (acute) or long term (chronic) depending on whether it lasts for less than or more than six months. Acute hepatitis can sometimes resolve on its own, progress to chronic hepatitis, or rarely result in acute liver failure. Over time the chronic form may progress to scarring of the liver, liver failure, or liver cancer.The most common cause of hepatitis worldwide is viruses. Other causes include heavy alcohol use, certain medications, toxins, other infections, autoimmune diseases, and non-alcoholic steatohepatitis (NASH). There are five main types of viral hepatitis: type A, B, C, D, and E. Hepatitis A and E are mainly spread by contaminated food and water. Hepatitis B is mainly sexually transmitted, but may also be passed from mother to baby during pregnancy or childbirth. Both hepatitis B and C are commonly spread through infected blood such as may occur during needle sharing by intravenous drug users. Hepatitis D can only infect people already infected with hepatitis B.Hepatitis A, B, and D are preventable with immunization. Medications may be used to treat chronic cases of viral hepatitis. There is no specific treatment for NASH; however, a healthy lifestyle, including physical activity, a healthy diet, and weight loss, is important. Autoimmune hepatitis may be treated with medications to suppress the immune system. A liver transplant may also be an option in certain cases.Worldwide in 2015, hepatitis A occurred in about 114 million people, chronic hepatitis B affected about 343 million people and chronic hepatitis C about 142 million people. In the United States, NASH affects about 11 million people and alcoholic hepatitis affects about 5 million people. Hepatitis results in more than a million deaths a year, most of which occur indirectly from liver scarring or liver cancer. In the United States, hepatitis A is estimated to occur in about 2,500 people a year and results in about 75 deaths. The word is derived from the Greek hêpar (ἧπαρ), meaning "liver", and -itis (-ῖτις), meaning "inflammation". Hepatitis C is an infectious disease caused by the hepatitis C virus (HCV) that primarily affects the liver. During the initial infection people often have mild or no symptoms. Occasionally a fever, dark urine, abdominal pain, and yellow tinged skin occurs. The virus persists in the liver in about 75% to 85% of those initially infected. Early on chronic infection typically has no symptoms. Over many years however, it often leads to liver disease and occasionally cirrhosis. In some cases, those with cirrhosis will develop serious complications such as liver failure, liver cancer, or dilated blood vessels in the esophagus and stomach.HCV is spread primarily by blood-to-blood contact associated with intravenous drug use, poorly sterilized medical equipment, needlestick injuries in healthcare, and transfusions. Using blood screening, the risk from a transfusion is less than one per two million. It may also be spread from an infected mother to her baby during birth. It is not spread by superficial contact. It is one of five known hepatitis viruses: A, B, C, D, and E. Diagnosis is by blood testing to look for either antibodies to the virus or its RNA. Testing is recommended in all people who are at risk.There is no vaccine against hepatitis C. Prevention includes harm reduction efforts among people who use intravenous drugs and testing donated blood. Chronic infection can be cured about 95% of the time with antiviral medications such as sofosbuvir or simeprevir. Peginterferon and ribavirin were earlier generation treatments that had a cure rate of less than 50% and greater side effects. Getting access to the newer treatments however can be expensive. Those who develop cirrhosis or liver cancer may require a liver transplant. Hepatitis C is the leading reason for liver transplantation, though the virus usually recurs after transplantation.An estimated 143 million people (2%) worldwide are infected with hepatitis C as of 2015. In 2013 about 11 million new cases occurred. It occurs most commonly in Africa and Central and East Asia. About 167,000 deaths due to liver cancer and 326,000 deaths due to cirrhosis occurred in 2015 due to hepatitis C. The existence of hepatitis C – originally identifiable only as a type of non-A non-B hepatitis – was suggested in the 1970s and proven in 1989. Hepatitis C infects only humans and chimpanzees. Hepatocellular carcinoma (HCC) is the most common type of primary liver cancer in adults, and is the most common cause of death in people with cirrhosis.It occurs in the setting of chronic liver inflammation, and is most closely linked to chronic viral hepatitis infection (hepatitis B or C) or exposure to toxins such as alcohol or aflatoxin. Certain diseases, such as hemochromatosis and alpha 1-antitrypsin deficiency, markedly increase the risk of developing HCC. Metabolic syndrome and NASH are also increasingly recognized as risk factors for HCC.As with any cancer, the treatment and prognosis of HCC vary depending on the specifics of tumor histology, size, how far the cancer has spread, and overall health. The vast majority of HCC occurs in Asia and sub-Saharan Africa, in countries where hepatitis B infection is endemic and many are infected from birth. The incidence of HCC in the United States and other developing countries is increasing due to an increase in hepatitis C virus infections. It is more common in males than females for unknown reasons. Hepatotoxicity (from hepatic toxicity) implies chemical-driven liver damage. Drug-induced liver injury is a cause of acute and chronic liver disease. The liver plays a central role in transforming and clearing chemicals and is susceptible to the toxicity from these agents. Certain medicinal agents, when taken in overdoses and sometimes even when introduced within therapeutic ranges, may injure the organ. Other chemical agents, such as those used in laboratories and industries, natural chemicals (e.g., microcystins) and herbal remedies can also induce hepatotoxicity. Chemicals that cause liver injury are called hepatotoxins. More than 900 drugs have been implicated in causing liver injury (see LiverTox, external link, below) and it is the most common reason for a drug to be withdrawn from the market. Hepatotoxicity and drug-induced liver injury also account for a substantial number of compound failures, highlighting the need for toxicity prediction models (e.g. DTI), and drug screening assays, such as stem cell-derived hepatocyte-like cells, that are capable of detecting toxicity early in the drug development process. Chemicals often cause subclinical injury to the liver, which manifests only as abnormal liver enzyme tests. Drug-induced liver injury is responsible for 5% of all hospital admissions and 50% of all acute liver failures. Liver cancer, also known as hepatic cancer and primary hepatic cancer, is cancer that starts in the liver. Cancer which has spread from elsewhere to the liver, known as liver metastasis, is more common than that which starts in the liver. Symptoms of liver cancer may include a lump or pain in the right side below the rib cage, swelling of the abdomen, yellowish skin, easy bruising, weight loss and weakness.The leading cause of liver cancer is cirrhosis due to hepatitis B, hepatitis C or alcohol. Other causes include aflatoxin, non-alcoholic fatty liver disease and liver flukes. The most common types are hepatocellular carcinoma (HCC), which makes up 80% of cases, and cholangiocarcinoma. Less common types include mucinous cystic neoplasm and intraductal papillary biliary neoplasm. The diagnosis may be supported by blood tests and medical imaging, with confirmation by tissue biopsy.Preventive efforts include immunization against hepatitis B and treating those infected with hepatitis B or C. Screening is recommended in those with chronic liver disease. Treatment options may include surgery, targeted therapy and radiation therapy. In certain cases, ablation therapy, embolization therapy or liver transplantation may be used. Small lumps in the liver may be closely followed.Primary liver cancer is globally the sixth-most frequent cancer (6%) and the second-leading cause of death from cancer (9%). In 2012, it occurred in 782,000 people, and in 2015 it resulted in 810,500 deaths. In 2015, 263,000 deaths from liver cancer were due to hepatitis B, 245,000 to alcohol and 167,000 to hepatitis C. Higher rates of liver cancer occur where hepatitis B and C are common, including Asia and sub-Saharan Africa. Males are more often affected with HCC than females. Diagnosis is most frequent among those 55 to 65 years old. Five-year survival rates are 18% in the United States. The word "hepatic" is from the Greek hêpar, meaning "liver". Liver failure or hepatic insufficiency is the inability of the liver to perform its normal synthetic and metabolic function as part of normal physiology. Two forms are recognised, acute and chronic. Recently a third form of liver failure known as acute-on-chronic liver failure (ACLF) is increasingly being recognized. Liver function tests (LFTs or LFs), also referred to as a hepatic panel, are groups of blood tests that provide information about the state of a patient's liver. These tests include prothrombin time (PT/INR), aPTT, albumin, bilirubin (direct and indirect), and others. The liver transaminases aspartate transaminase (AST or SGOT) and alanine transaminase (ALT or SGPT) are useful biomarkers of liver injury in a patient with some degree of intact liver function. Most liver diseases cause only mild symptoms initially, but these diseases must be detected early. Hepatic (liver) involvement in some diseases can be of crucial importance. This testing is performed on a patient's blood sample. Some tests are associated with functionality (e.g., albumin), some with cellular integrity (e.g., transaminase), and some with conditions linked to the biliary tract (gamma-glutamyl transferase and alkaline phosphatase). Several biochemical tests are useful in the evaluation and management of patients with hepatic dysfunction. These tests can be used to detect the presence of liver disease, distinguish among different types of liver disorders, gauge the extent of known liver damage, and monitor the response to treatment. Some or all of these measurements are also carried out (usually about twice a year for routine cases) on those individuals taking certain medications, such as anticonvulsants, to ensure that the medications are not adversely impacting the person's liver. Liver transplantation or hepatic transplantation is the replacement of a diseased liver with the healthy liver from another person (allograft). Liver transplantation is a treatment option for end-stage liver disease and acute liver failure, although availability of donor organs is a major limitation. The most common technique is orthotopic transplantation, in which the native liver is removed and replaced by the donor organ in the same anatomic position as the original liver. The surgical procedure is complex, requiring careful harvest of the donor organ and meticulous implantation into the recipient. Liver transplantation is highly regulated, and only performed at designated transplant medical centers by highly trained transplant physicians and supporting medical team. The duration of the surgery ranges from 4 to 18 hours depending on outcome. Favorable outcomes require careful screening for eligible recipient, as well as a well-calibrated live or cadaveric donor match. Wilson's disease is a genetic disorder in which copper builds up in the body. Symptoms are typically related to the brain and liver. Liver related symptoms include vomiting, weakness, fluid build up in the abdomen, swelling of the legs, yellowish skin, and itchiness. Brain related symptoms include tremors, muscle stiffness, trouble speaking, personality changes, anxiety, and seeing or hearing things that others do not.Wilson's disease is an autosomal recessive condition due to a mutation in the Wilson disease protein (ATP7B) gene. For a person to be affected they must inherit an affected copy of the gene from each parent. Diagnosis may be difficult and often involves a combination of blood tests, urine tests, and a liver biopsy. Genetic testing may be used to screen family members of those affected.Wilson's disease is typically treated with dietary changes and medication. Dietary changes involve eating a low copper diet and not using copper cookware. Medications used include chelating agents such as trientine and d-penicillamine and zinc supplements. Complications of Wilson's disease can include liver failure, liver cancer, and kidney problems. A liver transplant may be helpful in those in whom other treatments are not effective or if liver failure occurs.Wilson's disease occurs in about 1 in 30,000 people. Symptoms usually begin between the ages of 5 and 35 years and males and females are equally affected. It was first described in 1854 by Friedrich Theodor von Frerichs and is named after Samuel Wilson.